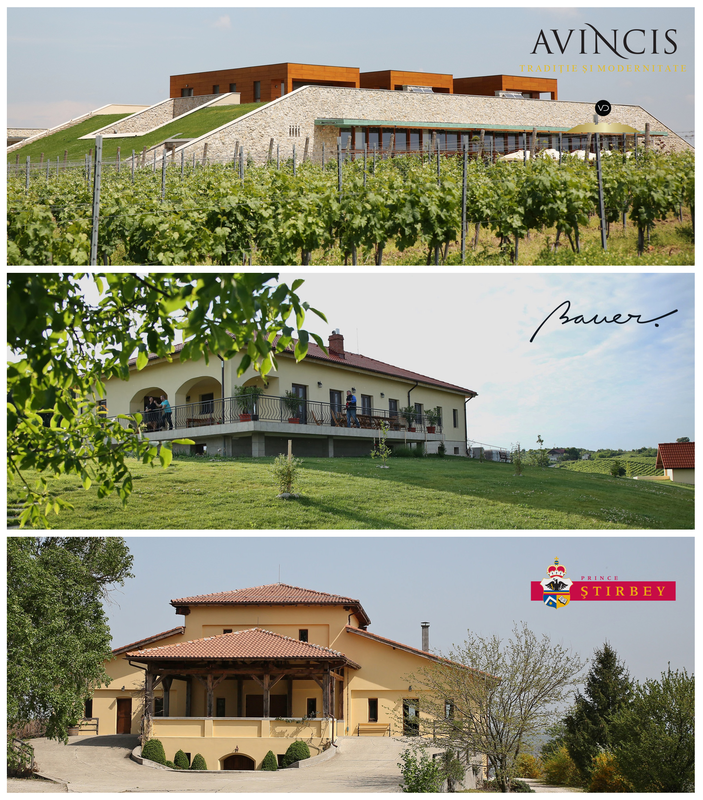 Wine Tours in Dragasani vineyard and its grape varieties, Why Romania? Romania is one of the few countries that can take pride in a millennium tradition of viticulture, being a highly appreciated country in this field until the Second World War. Dragasani vineyard is part of the wine region of Muntenia and Oltenia’s hills and is the oldest vineyard of Oltenia. It lies between the Getic Subcarpathians in the north and Campia Romana in the south and south-east and it is a relatively small space that extends further west and north of the Dragasani City. It is parallel to Olt river and its length is about 65 kilometers. The landscape looks like a narrow complex of hills with altitudes between 200-500 m. The dominant soils in the vineyard are clay with traces of limestone, sand, gravel and marl. The climate of the vineyard is temperate continental. Dragasani vineyard is known for growing three grape varieties for wine making: Cramposie Selectionata, Negru de Dragasani (Black from Dragasani)﻿ and Novac, varieties with great potential in making quality wine that can represent our country even at an international level. Currently, winemaking in Dragasani vineyard is competed by wine tourism, which is constantly growing; wine lovers are being offered full services with accommodation, meals, wine tastings, winery tours and walks in the vineyard. 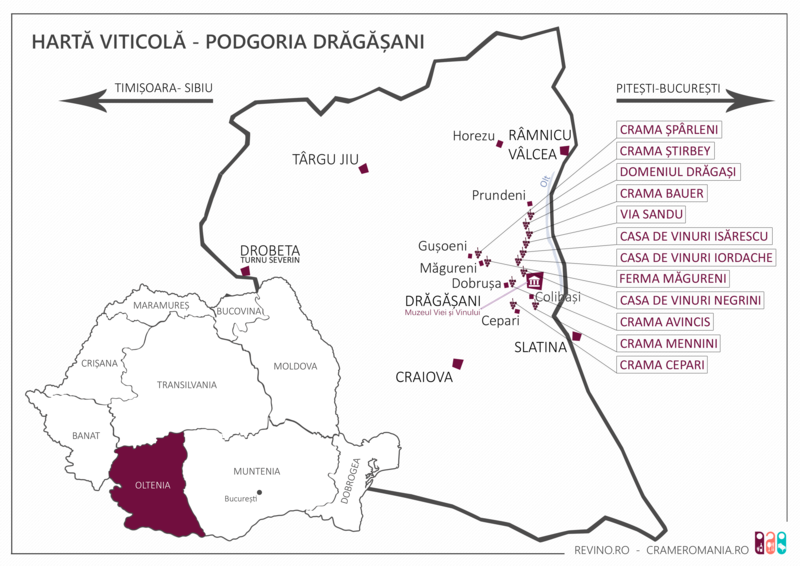 Several producers in Dragasani area have built an association that promotes both wine tourism in the area and the growing of high quality grapes and wine. For more than five years, there is accommodation space available for a quite large group of people at the wineries in Dragasani or in its vicinity. Accommodation for one night at the motel, inn or hotel costs between 150/300 lei for double room and the distance to the wineries is 2-7 kilometers. Avincis winery is one of the wineries that offer accommodation and is equipped with 15 rooms, studios and apartments, and the cost for two people (one night, breakfast included) is between 360-700 lei / studio or apartment. This cost includes wine tasting and a walkthrough presentation of the vineyard area. On the other side of the hill there is a very compact area with wineries, among which we name Ştirbey and Bauer. Stirbey winery was the first to develop wine tourism in the area since 2004. Baroness Ileana Kripp - Costinescu with her husband, Baron Jakob Kripp gave a revival to the Ştirbey princely family tradition, investing in rebuilding the Ştirbey winery and in the rediscovery of Romanian varieties. Currently, groups between 5-20 people are welcomed to the winery for tasting Stirbey’s wines, after a prior appointment. The cost varies between 65 and 185 lei / person. Just a kilometer away, with an impressive view of the Olt river, Bauer winery awaits its visitors for a complete experience and to discover together with the oenologist and owner of the winery, Oliver Bauer, the complex world of wines. Tasting glasses, wine-food pairing, vertical tasting are just some of the experiences that accompany wine tasting at Bauer. A guided tour of the winery accompanied by a tasting of 5 wines costs 65 lei / person and depending on the complexity of the chosen package it can reach 210 lei / person. In 1974, in Dragasani city, the current wine museum was built. The collected pieces are exhibited in three sections: wine, art and archeology. The building was built in 1920 in a Neo-Romanian architectural style. The museum has a rich collection of traditional systems for grapes, and evidence of viticulture practice and the continuity of the occupations in this region. The museum showcases the results can be observed international wine competitions abroad, but also old seedlings of grape vines. The Research and Development Station for Viticulture and Enology Dragasani (SCDVV Dragasani) helped create grape varieties and clonal selections, varieties for table grapes and raisins, and grape varieties for wine (known as Cramposie Selectionata, Negru de Dragasani (Black from Dragasani) and Novac). We organise wine tours and tasting experiences as well﻿. Info here.